Let me start with my recent experience with Ads.txt file. To be honest, I just came to know about it last week. It seems Ads is a short-name of Authorized Digital Sellers. It’s a new standard imposed by Google and other Advertising companies around November 2017. Consider this scenario. You are owning a blog/site and you are allowing advertiser to run ads on your site. But what if your site is hacked and somebody else is running ads on your site and you are completely unaware of that. Your site’s revenue is going to their account rather than yours. That’s where ads.txt file come into picture. As name suggests it allows your to Authorize specific Digital Sellers. Only DIRECT or RESELLER publishers are allowed to place ads on your site which you specified in your ads.txt file. This system creates more transparent ecosystem around digital ads automatically. What if you are running Google Adsense Ads? Google is not mandating ads.txt file currently. That means, publishers are not required to put ads.txt file into their root domain. In other words, if you don’t have ads.txt under your site’s root domain that means you are allowing any publishers to run ads on your site. There won’t be any verification performed on your site. 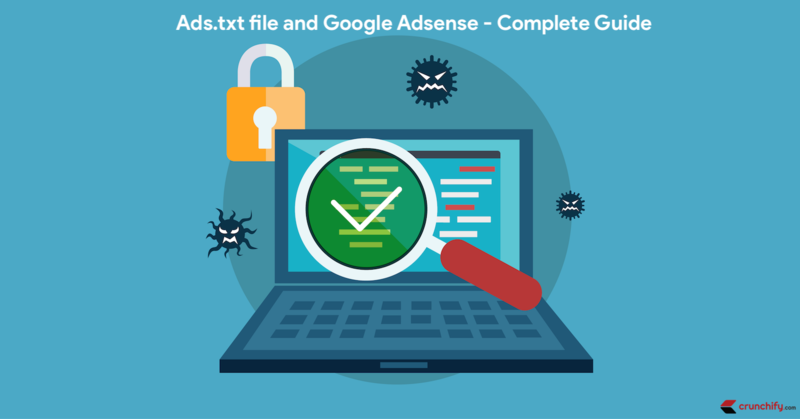 But there is a big if – if you have ads.txt file then it’s absolutely required for you to put your Google Adsense Publisher ID into it. Google will warn you in case you miss putting Adsense publisher ID into it into their admin console. Adsense system will also send you emails with more details. If you have ads.txt file and you forgot to put your Google Adsense Publisher ID. Error Message: Earnings at risk – One or more of your ads.txt files doesn’t contain your AdSense publisher ID. Fix this now to avoid severe impact to your revenue. 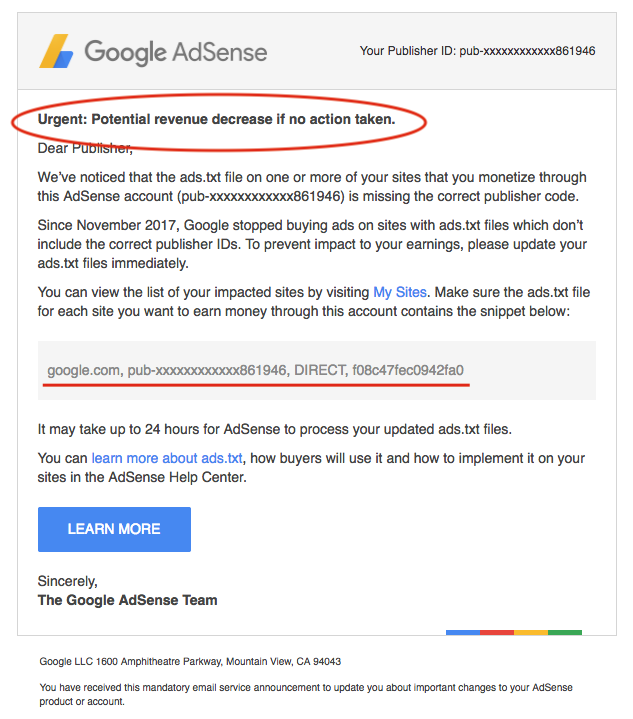 How to fix Google Adsense ads.txt error? Without this line Adsense will stop serving ads on your site. Once you update your ads.txt file then it will take upto 24 hrs for system to start serving ads again. Current ads.txt project version 1.0.1 details on official site: Link. I hope you detailed idea on how to setup your ads.txt file right way to stop loosing your revenue from Google Adsense and other Advertisers. It’s an easy process and I would recommend everybody to implement ads.txt file. Are you using any other Ad network? Please follow other Ad network’s detail page on how to implement and add more lines to your ads.txt file. Let me know if your revenue increase after white listing digital seller. Also, if your Adsense account is disabled then share screenshot and i’ll take a look into details. Great Tutorial App. I faced the same issue in January and it took 2 days for Google Adsense system to re-enable ads on my site.